This review was originally published in the Central Western Daily on Tuesday 22 July 2014. From the twisted and warped minds of famed Las Vegas illusionist duo, Penn and Teller, comes a new documentary that is neither twisted or warped but manages to be magic nonetheless. Tim’s Vermeer tells the tale of inventor and successful entrepreneur Tim Jenison and his obsession with unlocking one of the mysteries of the art world. Prior to the screening I was the last person you would invite to be on your table at a great Dutch painters trivia night, so apologies if you already are familiar with the topic. Johannes Vermeer (1632-1675) is renowned for his photo realistic painting style, seen in perhaps his most famous work, The Girl with the Pearl Earring. Said to “paint with light”, there has been much speculation that Vermeer utilised optical devices to aid his work. Armed with this knowledge, Jenison goes one step further and sets out to prove this theory by attempting to design and build an optical “machine” in order to paint his own Vermeer. I had the pleasure of attending Penn and Teller’s Las Vegas show at The Rio, which has been successfully running for the past 12 years. Highly intelligent and utterly hilarious, their act can be a little confronting if you do not agree, or are at least sympathetic, to their political ideals (libertarianism) or philosophical beliefs (atheism and skepticism). Unlike their fantastic pseudoscience debunking TV show, Bullsh*t!, Penn and Teller do not adopt their usual aggressive and confrontational style for Tim’s Vermeer. Instead we are drawn in with a gentle observational approach which does not cast judgement on Jenison’s preoccupation but rather simply takes us along for the journey. Directed by Teller and narrated by Penn (the former is the one who doesn’t speak onstage), it is hard not be totally absorbed in Jenison’s quest as he travels to Delft in the Netherlands to see where Vermeer worked, and London to speak to experts. He even is granted 30 minutes with the Queen’s own Vermeer in Buckingham Palace. Neither a painter or a tradesman, Jenison almost singlehandedly reconstructs the setting of The Music Lesson, including walls, furniture, props and costumes, before spending almost five years painstakingly recreating the painting one brushstroke at a time using his ingenious lens and mirror device. Although a shortlisting in the best documentary category in the 2014 Academy Awards did not eventuate into a nomination, Tim’s Vermeer is a fascinating and highly enjoyable tale of one man’s eight year quest. Edited from 25,000 hours of raw footage, Penn and Teller have crafted their own masterpiece. These reviews were originally published in the Central Western Daily on Tuesday 12 August 2014. This past weekend I had the pleasure of attending the 9th Possible Worlds Film Festival in Sydney. Celebrating the best of US and Canadian cinema, the festival is run by not-for-profit group, The Festivalists. Unlike my usual 2 weekend pilgrimage to the Sydney Film Festival, I only had 1 day to dedicate to screenings, but what I discovered was a well organised event with friendly volunteers and a varied program of documentary and narrative cinema. I’ll certainly be returning next year. As suggested by its title, Triptych is film divided into 3 sections. We firstly are introduced to Michelle, who has returned to her job in a second hand bookstore after a stint in a mental health institution, although she is far from symptom free. We then meet her sister, Marie, a singer struggling with a brain tumour diagnosis. The pending operation may rob her of her voice, and as we find out later, the memory of the sound of her father’s voice. Performing the operation will be Thomas, a neurosurgeon. With his marriage deteriorating, and a growing dependency on booze, his newly developed hand tremor may the signal the end of his career. A French Canadian production, Triptych is an adaption of Robert Lepage’s nine hour performance piece, Lipsynch. Using time shifts and other storytelling trickery, directors Lepage and Pedro Pires have created 3 intertwining tales which explore the importance of voice, disability and other stuff. Almost like a jigsaw puzzle missing a few pieces, the final result is an unfocused take home message. Or perhaps I needed a few more coffees. I was drawn to this US indie title specifically to see the performance of rising Aussie actor, Callan McAuliffe (I Am Number Four, The Great Gatsby, Underground: The Julian Assange Story). Set in a northern Maine town where the only future prospects for teenagers are potato farming, crime or getting out, Casper (Emory Cohen) and Dominic (McAuliffe) are best friends whose lives are on very different paths, despite their plans to leave town together. Dom is working hard harvesting potatoes to purchase his dream car. Casper is being drawn into the family business, smuggling drugs over the US – Canadian border. Largely improvised, the film is a bleak but fascinating depiction of working class American life. The cast is uniformly terrific, with strong performances, including believable Canadian-like accents, from Cohen and McAuliffe. Fans of Veep will recognise Sarah Sutherland (daughter of Kiefer) and Timothy Simons in supporting roles. Game of Thrones aficionados will enjoy Aiden Gillen (Petyr “Littlefinger” Baelish in GoT) as Casper’s slimy drug trafficking pa. This column was originally published in the Central Western Daily on Tuesday 5 August 2014. Last month, legendary comedy troupe Monty Python performed 10 sold out performances at London’s O2 Arena. With the first show selling out in 45 seconds, tickets for Monty Python Live (Mostly) were extremely hard to come by. Luckily for the majority of the planet, the final performance was recorded and will premiere in Australian cinemas this week. Bringing together John Cleese, Eric Idle, Michael Palin, Terry Gilliam and Terry Jones for the first time in 30 years (Graham Chapman checked out in 1989 but appears in video sequences), the live show consists of a selection of classic Python sketches and songs, with some added modern references and new song verses. For dedicated fans, this is a hilarious greatest hits compilation and a fantastic way to become reacquainted with the now much older Pythons, none of whom appear to be slowing down, at least on stage anyway. Newcomers might be tested by the lengthy run time (2 hours and 40 minutes, including a 20 minute interval) and wonder what the fuss is all about. Monty Python Live (Mostly) is just one of a growing array of special events coming to cinemas. Audiences now have access to opera (New York’s Met Opera), theatre (Driving Miss Daisy with Angela Lansbury), television milestones (Doctor Who: Deep Breath – the debut of Peter Capaldi’s Doctor) and live performances (Andre Rieu Cleans Out His Sock Drawer). Although I’m for anything that draws more people into the cinema, recorded live performances suffer from an audience disconnect and the Monty Python reunion is no different. Although the camera angles offer cinema audiences undeniably the best seat in the house, there is no substitute for live atmosphere. The video sequences, some new, some old, designed to give the cast time to change between sketches, drag. The etiquette of cinema-going frowns upon participating in the many sing-a-longs featured in the show, although I couldn’t resist the finale, Always Look on the Bright Side of Life. Sorry if you were sitting near me. The Dead Parrot, Argument Clinic, Four Yorkshiremen and Nudge Nudge are just a few of the classic sketches recreated on stage. A full orchestra accompanies the Pythons in such iconic ditties as Every Sperm is Sacred, The Lumberjack Song and I Like Chinese. A two storey stage, rolling sets and an all singing and dancing ensemble bring a big Broadway musical feel to the proceedings. Monty Python Live (Mostly) features many celebrity cameos from the likes of Eddie Izzard and Mike Myers, as well as a surprising appearance from Professor Brian Cox and the legendary Professor Stephen Hawking in the Galaxy Song. The show also features Carol Cleveland, the only female (unofficial) member of the troupe. Barring retirement funds needing another top-up, this is likely to be the last time to see Cleese, Gilliam, Idle, Jones and Palin share the same stage. For fans of classic British comedy, this is a must-see (but take a packed lunch and a cushion). For newbies, a marathon of classic Python movies before the concert film is recommended. This review was originally published in the Central Western Daily on Tuesday 23 September 2014. Way back in 1984, Kevin Eastman and Peter Laird self-published a single-issue comic, entitled Teenage Mutant Ninja Turtles. Within five years, Turtle Power had swept the world. TMNT merchandise was everywhere. Driven by the popularity of the kiddie friendly cartoon series, we had action figures, lunch boxes, costumes, t-shirts and breakfast cereal. In Australia, a daily tabloid newspaper even gave away collectible TMNT coins. I still have the full set, stored safely somewhere under my parents’ house. In 1990, Leonardo, Michelangelo, Raphael and Donatello made their way to the silver screen with a live action blockbuster featuring animatronic character heads created by Jim Henson’s Creature Shop. Although very clunky, I have very fond memories of watching the feature alongside my cousins in a packed suburban Sydney cinema during the school holidays. The film also spun off a top selling soundtrack album featuring some dodgy pop songs which happen to mention turtles in their lyrics (as most pop songs do). There was also quite a media frenzy when white rapper de jour Vanilla Ice was announced to appear in the sequel. By the time the rushed follow-up big screen adventure was released a year later, the TMNT craze had peaked and Mr Ice’s 15 minutes of fame had expired at the 10 minute mark. In 1993, a second sequel debuted to little fanfare. Following an animated attempt at a reboot in 2007, the “heroes in a half-shell” are back, and if you have kids, your disposable income is anything but safe. Directed by Jonathan Liebesman (Wrath of the Titans, Battle: Los Angeles), this $125 million live action feature is backed by producer Michael Bay. With motion capture technology utilised to bring the turtles to life, this film is a Michael Bay production in every way but one. It doesn’t run for three hours. Otherwise, all the hallmarks of a Bay production are present: it’s an overblown, flimsy, yawn inducing disposable piece of toy marketing. “Actress” Megan Fox stars as April O’Neil. An on-screen charisma vacuum, she is outdone by men in body stockings covered with ping pong balls in terms of acting and depth of character. Funny man Will Arnett is wasted as April’s cameraman, Vern Fenwick. And what on earth is Whoopi Goldberg doing here in a particularly unfunny cameo as O’Neil’s television news channel editor? The plot follows puff piece TV presenter O’Neil as she attempts to uncover the mysterious Foot Clan which has infiltrated New York City. Witnessing an attack be thwarted by four turtle shaped shadows, she meets our heroes…you know the rest. Plot holes abound but will probably go over the heads of the intended audience. A not-so-subtle plug for a certain pizza company that is associated with huts (not Jabba) made my wonder how one gets food delivered to a sewer. And a convenient new link between key characters, similar to the recent Spider-Man reboots contributes nothing but frustration. The 3D is passable but adds very little, except the ability to snooze with no-one noticing. Teenage Mutant Ninja Turtles is a definite miss in my books, but what do I know? The film has already grossed $333 million. Expect sequels, hopefully sans Vanilla Ice. This column was originally published in the Central Western Daily on Tuesday 16 September 2014. In pop culture, it’s funny how the time of your introduction to long running franchises gives you a sense of connection to a particular era of that television or film series. Although I watched from behind the sofa the never ending repeats of Tom Baker era Doctor Who episodes at half past five on Channel 2, my initial taste of first run Time Lord adventures starred Sylvester McCoy as the seventh Doctor. Although generally maligned, and probably the least popular of the incarnations, Sylvester McCoy is my Doctor. The same with James Bond. My cinematic introduction to 007 was at the now defunct Hoyts Roxy at Parramatta. Sitting alongside my grandmother, I was dazzled by the smooth talking exploits of…err…Timothy Dalton. Sure, there are higher points in the franchise, but the Welsh actor is my James Bond. I can’t say that the same phenomenon has occurred for Bond villains. By the late eighties, the bad guys were less cartoony and certainly less memorable. I can therefore only assume that my affinity for the metal mouthed giant Jaws came from repeat TV airings of Moonraker and The Spy Who Loved Me, most likely on Channel 10 and ushered in by Bill Collins. 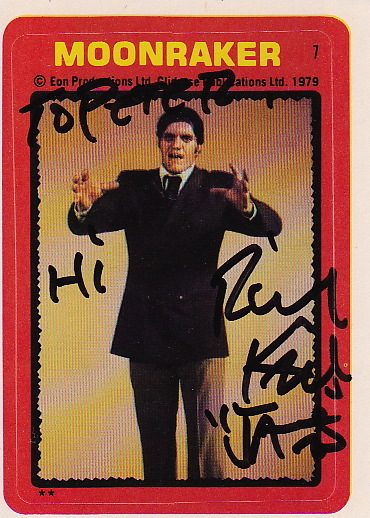 Richard Kiel, the 7’2” actor who portrayed Jaws, sadly passed away last week. 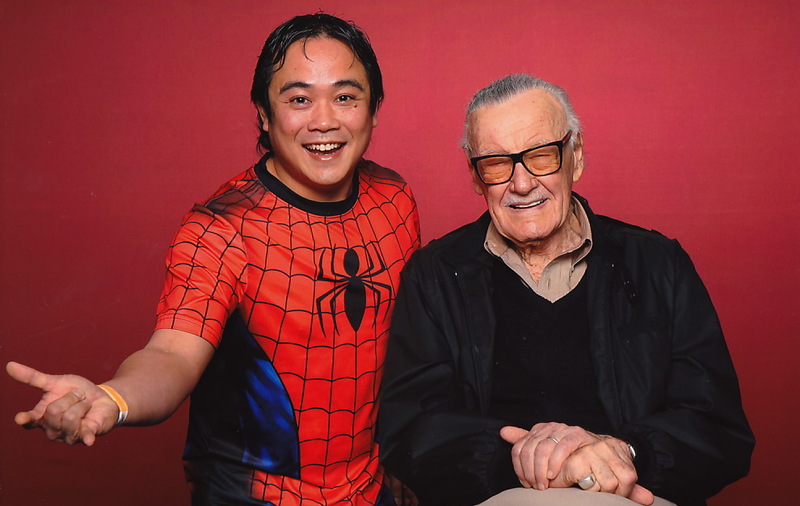 I fortunately had the pleasure of meeting Mr Kiel when he visited Sydney for the Supanova Pop Culture Expo in May. From all appearances, Kiel was not in the best of health. He struggled to move from his motorised scooter to the signing table. I had a brief chat with him and throughout he could barely lift his head to make eye contact with me. I had brought along a vintage 1979 Scanlens Moonraker sticker set for signing and he had a lot of trouble manipulating the card with his huge hands. Apparently a car accident in 1992 had made his mobility very difficult. Sadly, this gentle giant appeared to be succumbing to gravity. When Kiel attended a panel alongside one-off Aussie Bond George Lazenby, he rode into the room on his scooter and stayed there throughout the whole session. However, once engaged in telling tales from his Bond days and beyond, his face lit up. Kiel proudly told the audience how he had received a special watch from the Broccoli family and MGM to celebrate the 50th anniversary of the Bond film franchise. He spoke very fondly of Roger Moore and their ongoing friendship, as well as regaled us in some stories of their off-screen antics. I had no idea that Kiel had such a distinguished career, with over 50 TV series appearances and dozens of film credits to his name. One of his final on-screen appearances was as Mr Larson in the Adam Sandler comedy, Happy Gilmore. Kiel described how the majority of his shots are from the waist up, and that the only 2 scenes with him standing have him leaning on something. Although never surpassing his role in Bond, Hollywood has lost a beloved icon. There may be many James Bonds but there will only be one Jaws. These reviews were originally published in the Central Western Daily on Tuesday 30 September 2014. Based on yet another young adult fiction book series that you will never read, The Maze Runner initially shows promise. Within seconds, the audience is thrust into the action as our amnesiac protagonist arrives via elevator at “The Glade”. We share his disorientation as he attempts to remember who he is, establish his place within the primitive society developed by his fellow inmates and discover why he has been dropped into the middle of a giant labyrinth. I had high hopes for this film. Sure, I prefer my labyrinths with Muppets, Jennifer Connelly and David Bowie (in a fright wig) but the premise intrigued me. Unfortunately, what first time feature director Wes Ball delivers is a fun ride which ultimately frustrates. This truly is a teen action film by numbers. We have a dystopian future where unprepared teens are thrown into a deadly high concept arena as part of some nefarious conspiracy. Sound familiar? As the lead, Dylan O’Brien (TV’s Teen Wolf) is appealing but certainly does have the charisma that Jennifer Lawrence radiates in The Hunger Games franchise. Actor on the rise, Will Poulter (We’re the Millers, Son of Rambow) impresses as the alpha male of the group. In a testosterone heavy cast, lone female castaway Kaya Scodelario (TV’s Skins) does her best with an underwritten role. The film hits its stride once we leave The Glade (think Lord of the Flies meets Peter Pan’s Lost Boys meets an all male summer camp) and start exploring the deadly titular labyrinth. The set designs are inspired, as are the deadly spider-like Grievers which roam the maze. By the last act, it becomes clear that no resolution will be given to any plot strands. The credits roll on a cliffhanger and you’ll leave the cinema with nothing but questions and a slightly bad taste in your mouth. From the “sequels that no-one asked for” department comes the follow-up to the visually stunning and highly original Sin City (2005). By virtue of being more of the same, co-directors Robert Rodriguez and Frank Miller have managed to concoct three more graphic novel-inspired noir tales that now have little impact from a visual style perspective. And also now in pointless 3D. The majority of the original cast return for this outing, including Mickey Rourke as the overcoat wearing killer Marv. Well received as a supporting character in the original, gruff tough guy Marv is now a central character, which for me is now a case of too much of a good thing. Bruce Willis, Rosario Dawson and Jessica Alba reprise their roles, joining newcomers Joseph Gordon-Levitt, Josh Brolin and a very naked Eva Green. The bullets fly and the white blood flows thick. Once you become accustomed (or re-accustomed) to the visuals, it’s just a matter of whether you appreciate the very deliberate storytelling style of the film. I didn’t. I just felt completely disconnected from what was happening on the screen. Maybe that is the desired effect. Strangely released during the school holidays, this particularly non-kid friendly film is likely to sink without a trace at the box office. Wait for the DVD, or even better still, read the graphic novel.